Imaginary Friends and Cookies – domestic diva, M.D. I had a very active imagination as a child. My family went along with it. My favorite television show was “Pound Puppies.” I had a few of the stuffed animals (honestly, I found one in the closet a few years ago and it looks like an early beanie baby). However, Cooler the dog was also my best imaginary friend. Here Cooler, come on boy! Here Cooler Cooler Cooler! He then enthusiastically clapped and waited by the car door until I told him that Cooler had hopped in safely (and while the rest of my family died of embarrassment while the whole campground looked on). I only hope that one day I’m that kind of parent. Cream together shortening and sugars, then mix in egg, water, and vanilla. Add in flours, salt, and baking soda all at once and mix in. Add in oats, chocolate chips, and cranberries and evenly distribute through the batter (I find it’s best to use your hands for this step). Drop by teaspoonful onto a greased cookie sheet and bake for 10-12 minutes until middle of cookies just starts to set (they’ll already look more golden brown because of the whole-wheat flour). Makes approximately 20 cookies (this recipe easily doubles). I had Pound Puppy sheets as a kid! Funny how they haven’t made a comeback like so many other “Characters” from that time. I had a Pound Puppy when I was little. I can’t remember his name, but I recall he was grey and black. I loved that thing and played with until long after it lost its nose and one of its eyes. Sounds yummy. I can’t wait to try this recipe out! And I enjoyed the story as well. Loved the Pound Puppies. I had a “fake” one and a “real” Pound Puppy growing up but I honestly don’t remember their names. I was hoping they would make a comeback while my kids were young but they are just growing up too fast! Great blast from the past (oh, and a fabulous cookie recipe also)! They look fantastic. Thanks for posting the recipe, I’m definitely going to try these out. I like that you use cranberry instead of raisins. I hate raisins. I only like golden raisins in certain dishes. Otherwise I hate raisins, too! Ummm Yes! I loved the pound puppies, I even had the board game… Though I don’t remember the premise. Can’t wait to try your cookie recipe. So good to share healthy food ideas for kids. Thanks for stopping by my blog. Looks great – love the story I can imagine your poor Dad – got to love Dad’s. You always have the most inventive titles. Your personal accounts are written so warmly and casually, like what I’d expect to hear from a dear friend at a coffee shop. I love your creative writing style! It makes your blog such a joy to read! Amazing blog you have your DD M.D.!!!! I had a friend when I was very small, also imaginary, called Gabble. One time when leaving on holidays, house locked, car packed and everybody waiting, I did likewise but my Dad had to go back into the house and let Gabble out. I have grown up a little in the 50+ years since then. But not much. My absolute favorite cookies! I won’t use shortening, though…just regular old butter! I’ve also been known to only use brown sugar and whole wheat flour. They used to be AMAZING with those tuxedo white-and-semi-sweet swirled chocolate chips, but I can’t find them anymore. 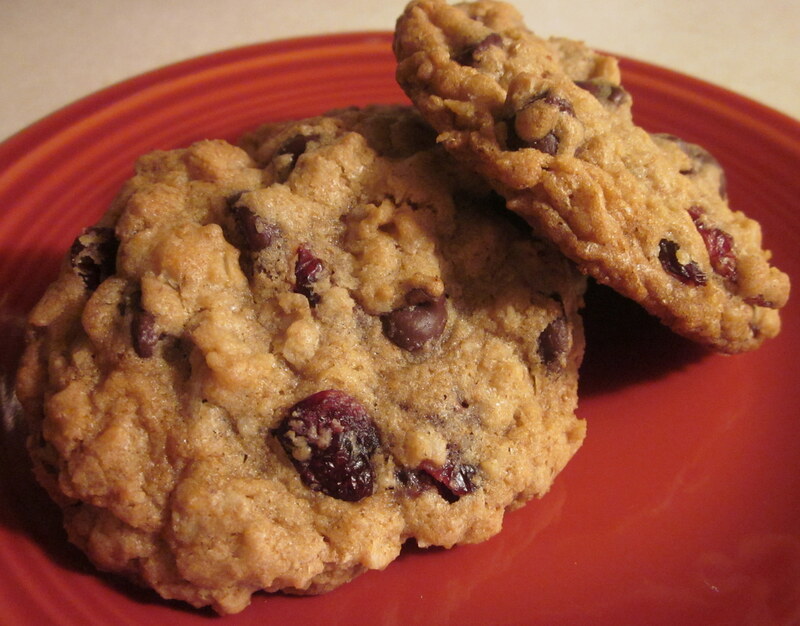 Hey, I love cookies with cranberries and chocolate chips! I am definitely going to be making these scrumptious looking cookies.